If you have any questions or enquiries about my services then please feel free to get in contact with me. China restoration and repair has been a passion for 25 years. 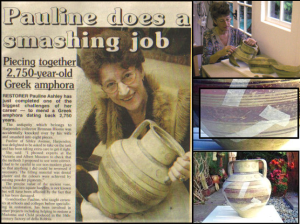 I was a potter for 30 years working with numerous types of clay bodies and different firing methods before attending several restoration courses and taking it up professionally in 1990. I love modelling missing parts, mould-making and using my expert colour matching skills; all of which require great patience to achieve the perfection I demand. I also spent 3 months in the glass restoration department of the Israel Museum in Jerusalem where I was cleaning and assembling glass fragments from 4th and 7th Century. Repairs range from ‘conservation’ or ‘museum’ quality (where the repair is reversible) through to invisible repairs. Repaired and finished articles are usually for display purposes only. 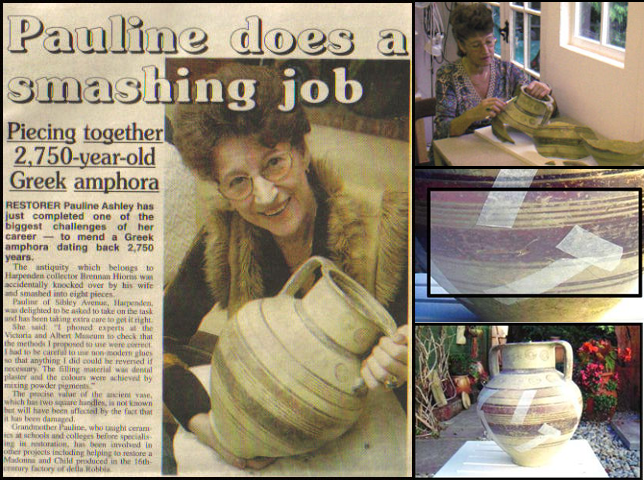 The variety of repairs over the last 20 years has covered working with china, earthenware, porcelain, raku, stoneware, terracotta, glass, ivory, jade, marble, onyx, papier-mâché, plaster, resin and other media from antiques to modern creations. Work includes repairs from the following factories: Beswick, Carlton Ware, Clarice Cliff, Capo di Monte, Crown Derby, Delft, Dresden, Limoges, lladro, Majolica, Meissen, Minton, Moorcroft, Nao, Poole, Royal Copenhagen, Royal Doulton, Royal Dux, Royal Worcester, Samson, Shelley, Susie Cooper, Wedgewood, and studio potters like: The Martin Brothers, Bernard Leach, David Leach, Elaine Peto, David Frith and many others. In addition, I have also repaired Japanese Noritake, Satsuma, Chinese and Oriental ceramic pieces.